Above, the Frederic and Christena (Fowler) Durr children with their spouses. Photo dated March 8, 1894. 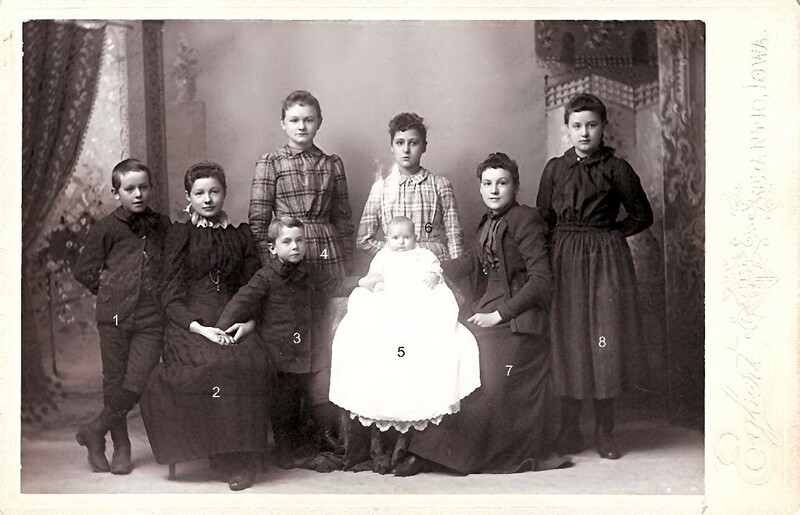 Front row, left to right: Emelina Augusta "Gusta" Durr , John Fredrick "Fred" Durr, Evangeline "Eva" (Durr) McClure. Center row, left to right: Fred Durr, Louise C. (Durr) Hunt, Mrs. Fred Durr (Ida Day), Mary F. (Durr) Saxe. 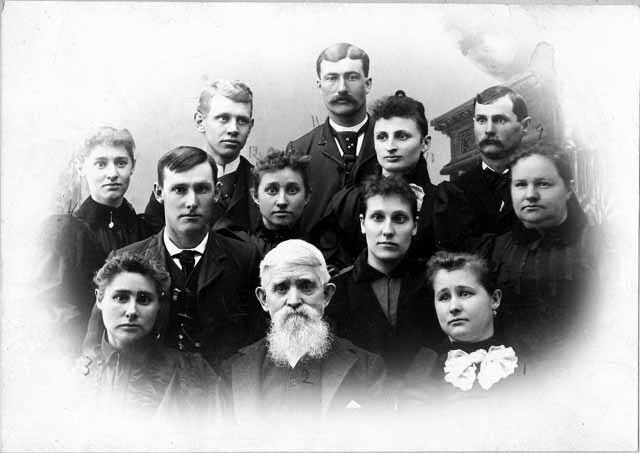 Back row, left to right: Elizabeth M. "Lizzie" (Durr) Fuhlendorf, Christian Gearhart Fuhlendorf, Samual A. Hunt, Sophia C. (Hogg) (wife of Henry), and Henry Martin Durr. Below, the Frederic & Christena (Fowler) Durr grandchildren. Front row, left to right: 1. Edward A. Saxe, 2. Ida Saxe, 3. Raymond Laverne Haver, 5. Baby Ralph Carleton Durr, 7. Emma May Saxe. Back row, left to right: 4. Gertrude Henrietta Saxe, 6. Elsie Lorreine "Bess" McClure, 8. Jennie Saxe. Contributed May and June, 2016, by Carl Malone.